POPE FRANCIS LEAVES A FRATERNAL MESSAGE OF PEACE AT THE END OF WYD IN PANAMA. 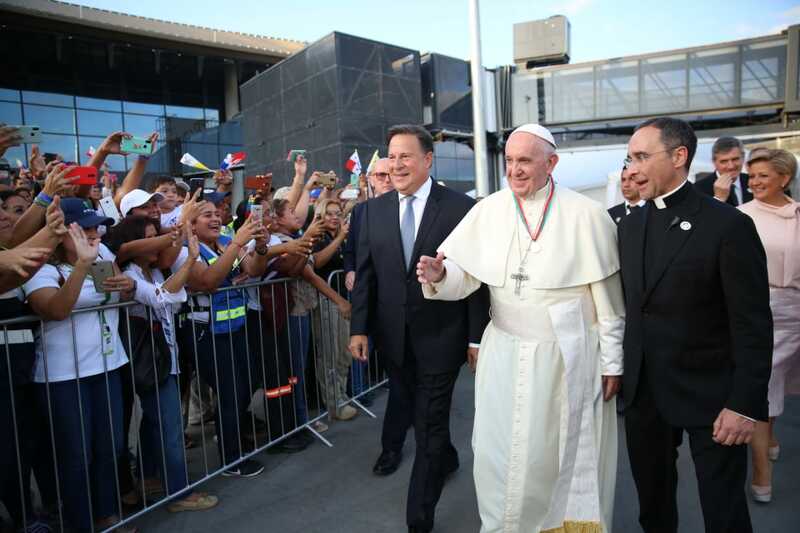 The President of the Republic, Juan Carlos Varela, bid farewell in Terminal 2 of the Tocumen International Airport, to his Holiness Pope Francis, who made an official visit to Panama, which began on Wednesday, January 23 to head the World Day of the Youth (WYD) and that concluded this Sunday. The President said thank God and Pope Francis for this blessing of having been the headquarters of WYD and above all congratulate the Panamanian people because he showed his great heart to the whole world and the great things he can do when we are all united. He also congratulated the ranks of the Public Force that participated in the different operations with the visit of His Holiness the Pope to Panama; He also thanked all the host families who had their homes and time to assist thousands of pilgrims who attended this day. The President described the last minutes he lived with Pope Francis prior to his departure to the Vatican and noted that the hierarch of the Catholic Church sees Panama as a nation with much responsibility to the world for its geographical position, the Canal and that this it goes beyond borders. “It was a moment of unity of the whole town and so we must continue with this atmosphere left by Pope Francis and put aside the differences that prevent further work to move forward with this beautiful country,” he added. He also highlighted a regional WYD that gave opportunity to young people from neighboring countries to work together with Panama to plant in this sector of the world a seed of hope in the face of challenges mainly in search of peace. For President Varela, the words of God that Pope Francis brought to this day were impressive, however, he was shocked by the one given at the Center for the Compliance of Minors, where the Holy Father spoke to these young people who have made a mistake in their lives and encouraged to see a horizon, a future where the “moth” does not corrupt their lives again. Finally, he concluded that WYD was a country event that results in thousands of ambassadors around the world who return to their lands, who take the heat of this town and can tell about Panama. Pope Francisco arrived in Panama on Wednesday 23 on an Alitalia flight from Rome and was received with the honors of a head of state by President Varela, first lady Lorena Castillo de Varela, vice president and chancellor Isabel De Saint Bad of Alvarado and the ministers of State. After the welcome ceremony and a representative cultural event, Pope Francisco carried out a tour in different areas of the capital city, where he shared with the thousands of Panamanians and foreigners stationed along the route established for his journey in the popemobile . On Thursday, the Holy Father began his official agenda with a visit to Palacio de las Garzas where he greeted the presidential family. From there he moved to the Bolívar Palace, headquarters of the Panamanian Chancellery, where he presided over the only official act in his role as head of state. There he intervened and told those present, including President Varela, the First Lady, national authorities, the Diplomatic Corps and representatives of the country’s civil society, that Panama is a land of convocation and dreams. He also thanked all the Panamanian people for the invaluable effort to welcome so many young people from all over the world. “Thank you for opening the doors of the house,” he stressed. Later, he met with the Central American bishops in the Church of San Francisco de Asís. On Thursday afternoon, his Holiness had his first encounter with the pilgrims in the Santa María la Antigua field, located on the Cinta Costera, where he officiated a mass and invited young people to be bridge builders and not walls and love the same way that Jesus loved. “Do not be afraid, let them go forward with that renewing energy and that constant restlessness that helps us and mobilizes us to be more cheerful and available, more witnesses of the Gospel,” he pointed out. On Friday, Francisco met with young prisoners at the Child Enforcement Center of Las Garzas de Pacora and in the afternoon he made a via crucis with the young people on the coastal strip. On Saturday the 26th the Supreme Pontiff officiated a mass in which he dedicated, consecrated and blessed the renewed altar of the Cathedral Basilica Santa Maria la Antigua. Later he met with young people who are preparing in the San José Major Seminary. In the afternoon he participated in a vigil with the young pilgrims in the Campo San Juan Pablo II Metro Park. I am dealing with young people and adults suffering from HIV / AIDS. Subsequently, he met with thousands of volunteers, national and international, to whom he thanked all the work done for the successful completion of WYD.